Direct sowing with natives: long term failure or success. Owlsclover, direct-seeded in new construction, Fresno County, Highway 41, Mile 18.00, near junction of America Ave. Seed was drilled two years ago at the rate of 20 lbs. 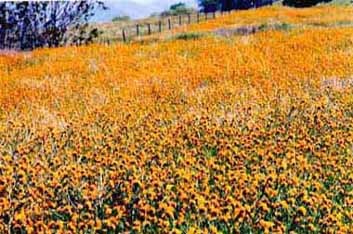 to the acre, consisting of the following species (PLS/acre): Sheep's fescue 7 lbs, Rose clover 6 lbs., Nodding needlegrass 3 lbs., Lupinus bicolor 3 lbs., Lupinus sparsiflorus 2 lbs., California poppy 1 lb., Tidy tips 2 lbs., Baby blue-eyes 1 lb., Pine bluegrass 1/2 lb., Goldfields 1/2 lb., Owl's clover 1/4 lb. and Toadflax 1/4 lb. The owl's clover was <2% of the mix. Photo taken 5-6-2000 and copyright © 2000 by Craig Dremann. Natural stand of native Amsinckia, Kern County, Highway 58 junction with Highway 223, Arvin. Photo taken 4-3-2000 and copyright © 2000 by Craig C. Dremann. Direct sowing with natives and learning to read the results: Long term failure or success of the sown seed mix can be determined by checking the seed mix and examining these two pictures.